Today 30 July the decision of the court of Patras (Western Greece) was to let anarchist comrade Christos Stratigopoulos free on bail. Dark Nights is an anarchist & anti-prison PDF freesheet to download and print out on the fly. Click here: 4 pages A4 / Double sided A3 / Print to size. This issue has a special front-page contributed by the comrades in Mexico of Conspiracion Acrata, an insurrectionary anarchist magazine, about refusing the legalistic demands of the State, and the anarchist-individualist thought which informs this. 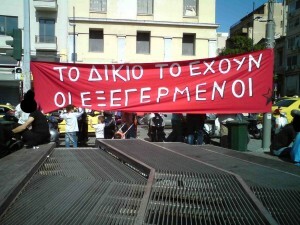 Plus, round-up of news : from UK, about police repression of an anarchist demo during the N30 General Strike; from Greece, news about the continued political-judicial harassment of Christos Stratigopoulos, who was arrested for a bank robbery alongside Alfredo M. Bonanno in Trikala, now accused of more ‘crimes’ of expropriation; Montreal, Canada, was the place of a great solidarity action for G20 prisoners, with an interesting and critical flyer denouncing the prison system and capitalist society; and not least, again from Greece, a short report of an action with molotovs against riot police in Exarchia outside the Culture Ministry, Athens, shortly after the attempt by imprisoned members of CCF and P.Vlastos to escape from Korydallos prison. 1. About “Anti-Judicial Anarchism”, Max Stirner, Luigi Galleani, CCF & More. 2. UK: Mass Arrests in Hackney. 3. Montreal, Canada: Counter-info action in solidarity with the G20 prisoners. 4. Greece: Solidarity with Christos Stratigopoulos. 5. Greece: Riot police attacked with molotovs at the Culture Ministry in Exarcheia, Athens. Organise & Resist – Zines are for life not just Xmas!! “In the early hours of Tuesday, April 20th, a van belonging to Serco – a big player in the construction and management of private prisons – was torched in Montpellier, north Bristol. We took this action to express our solidarity with the anarchist comrades in Turin whom the Italian state continues to attack under the precarious appearance of conspiracy, for nothing other than the distribution of anti-racist propaganda. We also attack for the comrades in Greece accused of participation in the ‘terrorist’ organization, Revolutionary Struggle. Need it be said that we remember Alfredo and Christos, imprisoned in Korrydallos for a revolutionary act of expropriation against a bank in Trikala last October. Until every filthy manifestation of this social prison in nothing but broken glass and burnt rubble, we will continue to fight. “At 2am on 17 March, anarchists attacked the inner-city probation offices in Stokes Croft, Bristol. Athens, 25 Feb. – Alfredo Bonanno, the Italian anarchist over 70 years old imprisoned last October following an accusation of concourse in robbery of a bank in Trikala, is suspected of being the author of another robbery carried out last July at Argostoli, on the island of Cefalonia. Bonanno’s lawyers contest this accusation. According to police sources cited by the media, Bonanno, with a false beard and wig, would have been recognised by one of the witnesses on the basis of a cctv video, while he robbed the Bank of Cyprus, pistol in hand, 6 July in Argostoli. The information has been partially confirmed to Ansa by a spokesman of the central police station, according to which “an old Italian is considered author of the robbery at Argostoli, which rendered 26 000 euros”. The spokesman did not give Bonanno’s name directly but implied that it was him. There is nothing left; nothing that hasn’t been molded, molested, or completely crushed; nothing that has managed to escape the network of power as it scours every inch of the earth, lodging itself into every crevice. Crowding each moment, the omnipresent asphyxiation provides ample evidence to this all-encompassing totalization. Heads bowed, backs bent, we bear the weight of the day in our beleaguered entrails. Now taking on increasingly monstrous qualities, a vampire-likeness of achieved full nocturnality, even the sleeper finds his dreams inhabited. Robbing us of expectations, snatching away our latent potential, Capital has acquired the speculative capability to recuperate futures and integrate things before their invention. After colonizing the entire world, the enemy now works to conquer the collective realm of our imaginations where we once plotted and, consequently, envisioned its very demise. the spotlight by ushering “communization” and “insurrection” into the academy’s discursive field. Both trends can be written off as failed experiments because each has neglected to activate the only concept capable of giving jargon any significance. The Struggle. In practice, the clashes and occupations have divorced the leftist baggage and chosen everyday life as the terrain for conflict, yet unfortunately expression still continues to abide by the activist calendar. A day of action is paled by a year of misery. Like long fits of depression, extended bouts of downtime undermine each subversive act, resulting in the production of militant event planners: blinded to the past and merely anticipating the next unsuccessful Bastille storming. They strike at the same tempo ordinary citizens attend birthday parties, riot at the same rate of wedding crashers and surely, at this pace, they will never RSVP the bourgeoisie funeral. In the early hours of Tuesday 23rd February 2010, anarchists attacked the Royal Bank of Scotland HQ in the heart of developing Bristol, UK. Despite road traffic and proximity of security, the mob succeeded in breaking windows, smashing paint-bombs against upper floors and setting fire to tyres in the middle of the road. A litany of abuses by RBS or any other bank could continue for pages, but it is enough to state that every bank is part of the financial prison which incarcerates and impoverishes all of us. These actions will escalate and multiply. We dedicate this action to all indigenous fighters and their allies struggling against the Tar Sands project in Kanada which RBS is an investor in, and also all those who fight against the 2010 Winter-Olympics. This action is also in solidarity with Alfredo M. Bonanno, Christos Stratigopoulos, Polykarpos Georgiades, Vaggelis Chrisohoides, Giannis Dimitrakis, Gabriel Pombo da Silva, the entire London G20 defendants/prisoners and all other prisoners in struggle. For international struggle against capitalism and the state. The two anarchist comrades, Alfredo Maria Bonanno and Christos Stratigopoulos, accused of being involved in a bank robbery in Trikala, Greece have had their bail refused. Alfredo must come out of the prison now. Alfredo has serious health problems and needs medical treatment. Alfredo Maria Bonanno remains inside the prison based on his ideas and long reputation as a writer and theorist of anarchism. An anarchism which is not yet dead, which is not yet decaying in the pages of history but is very much alive and growing in ferocity. An anarchism which will tear a hole in the guts of the European Union. An anarchism long based in the South European ‘Mediterranean Triangle’, of Greece, Italy, and Spain, however finding fertile, rich ground to spread within many more minds not held by any borders, who are receptive to the anarchist vision of a future world without Church, State and Capital. Neither subjugation nor poverty. This is an anarchism of freedom, joy and solidarity. An anarchism of stones and fire, of subversion and attack. This is the dynamite that explodes against the class enemy in Santaigo, Chile; the broken and smashed banks of countless dead cities of the USA & UK; the burnt BMW and Porsche of Berlin and Hamburg, Germany, which light up the night-sky for a precious passer-by; the gas-canister defence of Thessaloniki and Athens now turned quite deadly. This is the anarchism of a complicit glance exchanged in a hostile crowd, or in a queue, or at work; sometimes like a smile, a warm expression of joy, sometimes like a friend who picks you up from the dirty punch you took all your life, or sometimes like the bullets which will find themselves periodically in the heads of powerful individuals and their pawns. Alfredo; a writer who never betrayed his ideas in the pen and ink of conjecture, but wrote his words to express the realities around him, insights which came from the living social struggle that still remains in the hearts of many people, who will never stop dreaming about a beautiful life that has been denied to them by the prison society of capitalism and power. This is an anarchism which cannot be jailed, cannot be repressed, cannot be put out, because it does not belong to anyone. This is an anarchism, which through the simple methods which people use to defend themselves from oppression, communicates itself through resistance and so finds friends everywhere that people have not given up hope that they can change the conditions that make their life miserable. Destroy All Prisons – Free Alfredo & Christos. From within a climate of daily anarchist action and the brutal repression of every aspect of our lives I am taking the liberty of informing you of two important developments concerning the detention of Alfredo Bonanno. As you already know Alfredo Bonanno and Christos Stratigopoulos were transferred to Korydallos prison one day before the transfer of the murderer Korkonea to the prison of Amfissa. There, the pharmacy refused to grant him his medication for diabetes and severe pain in the shoulder caused by a tumour diagnosed by doctors at the health centre of Amfissa. Following pressure from their comrades a doctor sent by the Italian Embassy visited him in prison where his serious state of health was confirmed. I would like to inform you that at this time the investigator in Trikala is deliberating the application for Alfredo’s release on bail. Following the new detention measures of the Ministry of Justice, Bonanno’s advanced age (73 years), his compromised health and his detention for a misdemeanor (given that Stratigopoulos has assumed responsibility for the armed robbery), it is patently clear that his continued detention is an exemplary one of political revenge. Alfredo Bonanno is a revolutionary anarchist comrade and a writer of many works. That is why he is being held, if it wasn’t him, he would already be free until the trial. I decided to take generic medications, after reading the reviews at https://www.caladrius.com/online-pharmacy/. But for us, for whom solidarity is our weapon and who know that in any uprising we will be dynamite, we will not abandon our comrade. We demand the immediate release of Alfredo Bonanno. Freedom now for Alfredo Bonanno. Ps. The following fax has been sent to the Minister of Justice Trasparency and Human Rights, Athens, the Italian Embassy in Athens and the press. We wish to denounce the abusive and illegal detention of Alfredo Maria Bonanno in unacceptable conditions in the prison of Koridallos (Athens). The vindictive politic of the State is aimed at the physical and psychological annihilation of the 73-year old comrade who is facing serious health problems. Alfredo Bonanno is an anarchist, who has been involved in the movement for decades, militant in the resistance against the dictatorship of the Greek colonels (1967-1974), and writer and editor of many works. Alfredo Maria Bonanno and Christos Stratigopoulos, anarchists imprisoned in Greece accused of carrying out a bank robbery, have been moved from Amfissa prison to the Korydallos prison of Athens. Alfredo was throughout the move in handcuffs, and Christos without, also the bag of Alfredo was ‘lost’ in transit by the screws. More updates to come- from the 20th Jan 2010 there will be a legal decision over the question of them coming out of the prison on bail before the upcoming trial. Here is a new solidarity poster for the two comrades. Never give up – Never give in.